Date: 24 September 2013. Prepping - Plastics. 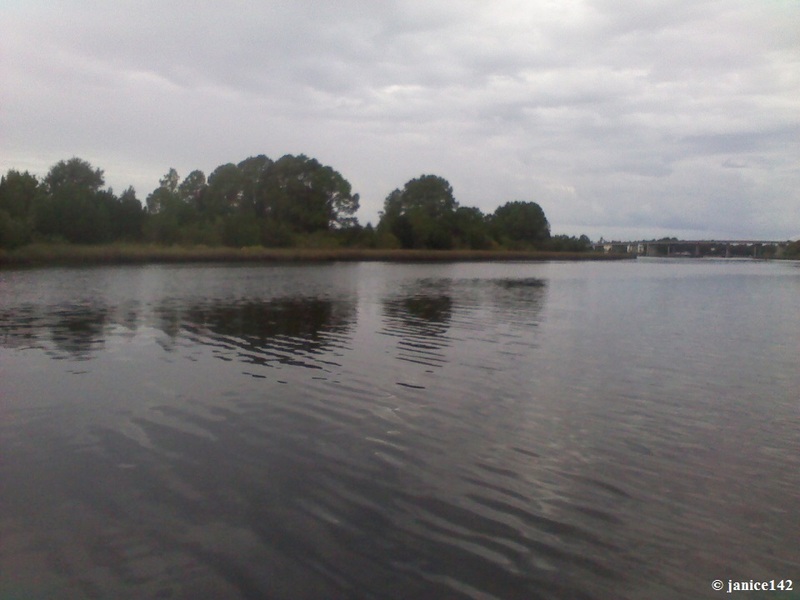 The view may not be blue skies and green water today, however even on an overcast day there's nothing like relaxing, reading and watching nature as the seasons change. All those things are possible because I did the tough job of Stuff Removal. It's not pretty and he has admitted that a couple months back he couldn't find lids so he went to the store and bought another set of containers. In looking I can only assume he kept the originals for some reason that is beyond me. For a life on a boat that mess above will not do. So, first things first: grab a large plastic garbage bag and any round container and lid goes into bag. All the round ones must go because they do not use space as well (stow as tightly together) as rectangular and square containers. Those with compartments also ought to be re-homed. 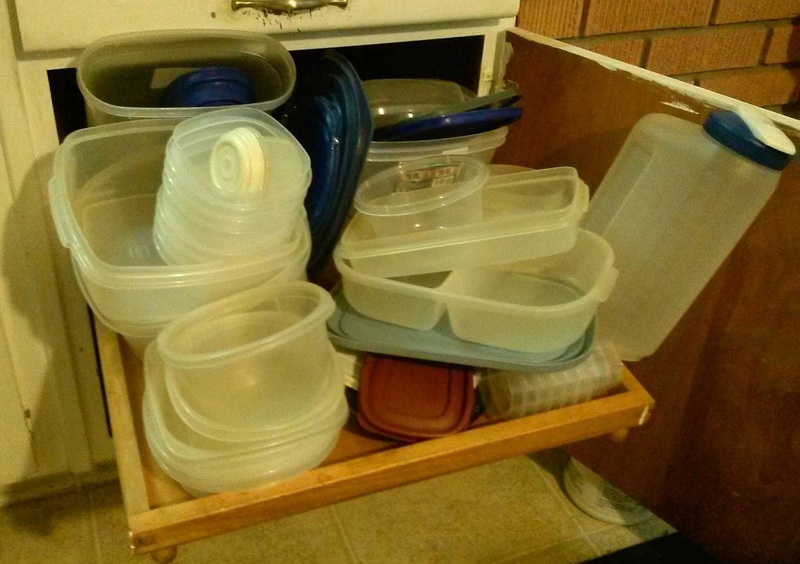 Any container lacking a lid or top lacking a box is just clutter. We are not keeping for another day Stuff. Don't think of this project as wasted money. This is Job One in preparing to be a boater. As you can see from the above disaster field, Mr. Anonymous has a bunch of stacking containers and in my view they aren't very good either. I believe you'll find nesting fits more into a smaller area. He may want one of the larger ones (for mixing and for pot-luck get-togethers) however he needs to rethink and cull ruthlessly his collection -- it's a mess. Clearing out the clutter is not easy however the road to riches never is. It's time to get this show on the road, er, waterways! The green markers lead cruisers out the channel and into the Gulf of Mexico. 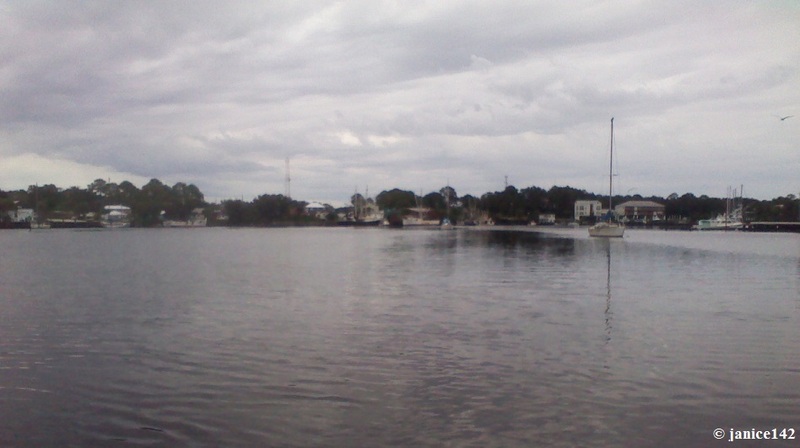 There is an osprey atop the mast of the sailboat in the foreground though you'll have to click on the picture to make it bigger. Remember in the Computer Short-cuts article you learned to hold down CTRL key while clicking? Try that on the picture above. The picture also illustrates what awaits you though first you have to do the work and specifically that means getting rid of the extraneous Stuff you've collected. Aboard a boat your refrigerator (if you have the power to turn it on) will be much smaller than what you're used to ashore. You're not going to have the luxury of cooking in large quantities and stashing aside stuff in the reefer* or freezer. *reefer is what many boaters call our refrigerators. The next time you're at Home Depot take a look at the tiny refrigerators that sell for less than $150. Mine's a $70 Haier cube sold at Walmart; these units are small so having big containers for leftovers is not practical. Even the bigger $400 units are probably only going to be useful on the larger yacht-boats. On Seaweed I simply do not have the power available to make a larger reefer an option. Now the better of those plastics Mr. Anonymous has collected will work for storage of dry goods, if they are genuinely air tight. That means those flimsy ones that are four-for-a-buck at the discount stores won't work. Sturdy containers that will hold small quantities -- that's what you're going to shoot for aboard your boat. Big containers are out for day to day use because we all fight dampness. It's easier to keep fresh if the box isn't huge. 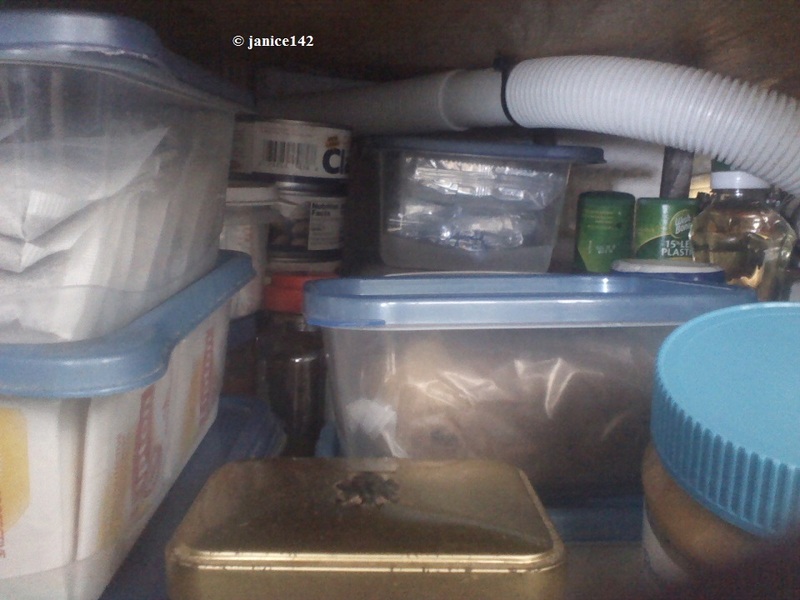 This is one section of below my sink storage and I you'll see I stacked quite compactly. The rectangular containers hold a lot of food in a small area under the sink in my galley. As you go thru your stock of plastic containers definitely pitch (give away, get rid of, donate) those that will not work aboard a boat. And think how nice it will be to have one section of your lockers that is neat and tidy. Do not clutter it up! From now on you'll be able to open that one area and see order where once there was chaos. Seriously, if you won't need the containers afloat, you don't need them now. And don't worry: it does get easier... Step Two in a week or so. I'd love to hear of your progress. And, are you interested in the the series continuing? A favorite aphorism: If a messy kitchen is a happy kitchen, some kitchens are delirious.